Chad Clinger | Galion Inquirer Brady Hettinger, Braxton Giavedoni and Brandt Nowaskie (Left to Right) earned the Graders Greats of the Week honors for their performances in games played June 27 through July 1. GALION — When the hometown Galion Graders began last week, they were below .500 at 6-7. At the conclusion of that same week, the Graders sat at 9-8 and tied for second place in the Central Division of the Great Lakes Summer Collegiate League with the Grand Lakes Mariners. 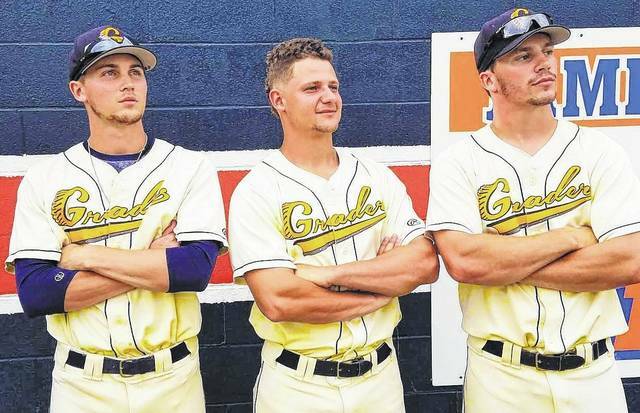 The turnaround was possible thanks in large part to a trio of Graders’ outfielders. Brady Hettinger, Braxton Giavedoni and Brandt Nowaskie are the Graders Greats of the Week for games played June 27-July 1. Hettinger is a 5-foot, 11-inch, 175-pounder from Chandler, Arizona. He plays his collegiate ball in the spring for Indiana University-Perdue University Indianapolis (IUPUI). He had quite a week at the plate for the Graders, batting .385 (5/13) with five singles, five runs scored and five runs driven in during limited action. Side note: The Vice-President of the United States of America, Mike Pence is an alumni of IUPUI. Giavedoni got off to a heroic start for the week. In the first two home games of the week against the Hamilton Joes, He may have only gone 3/11 at the plate, but two of those hits were the definition of clutch. Giavedoni went 2/6 overall in the 12-inning affair against Hamilton on Tuesday with two doubles and two runs batted in. One of those doubles — and both of the RBIs — came in the bottom of the 12th to drive in teammates Joe Crank and Austin Hathaway to give the Graders a 5-4 victory. The next day, Giavedoni had just one hit in five at-bats, but that one hit was an RBI single to drive in Nowaskie for another walk-off win against the Joes;, 7-6. Entering the bottom of the ninth on Wednesday, Galion trailed Hamilton 6-2. Overall for the week, the 5-foot, 11-inch, 185-pound sophomore from Penn State was just 3/20 (.150) with two doubles, a single, four runs batted in and two stolen bases. Giavedoni calls Punxsutawney, Pennsylvania home and yes, that’s the same home of Punxsutawney Phil, the beloved groundhog that predicts when spring will arrive. “It felt good to just give my team the win, to know that when I step up there, they have confidence in me to get the job done,” Braxton said of his two walk-off hits. Nowaskie finished 5/11 (.455) at the plate during his week for the Graders. In addition to scoring the winning run Wednesday for Galion, he scored three other runs, drove in four total runs, stole a base and belted two doubles and two singles. Nowaskie 6-foot – inch and hits the scale at about 200-pounds. He calls Bruceville, Indiana home and is a sophomore at Indiana State University. Yes, the same Indiana State that was graced with Larry Bird’s presence from 1976-1979. Congratulations to these young men on a great four games and for earning the honor of Graders Greats of the Week! https://www.galioninquirer.com/wp-content/uploads/sites/38/2017/07/web1_Brady-Braxton-and-Brandt.jpgChad Clinger | Galion Inquirer Brady Hettinger, Braxton Giavedoni and Brandt Nowaskie (Left to Right) earned the Graders Greats of the Week honors for their performances in games played June 27 through July 1.